As time progresses it seems that hatred becomes more and more abundant. The news is filled with rioting and murder which seems to be the result of fierce hatred for certain people and groups. Sometimes we must just reflect upon what God says about hatred. 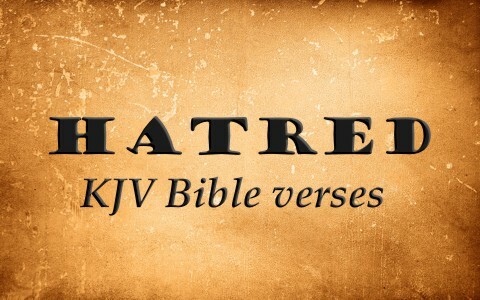 Take a look at these enlightening KJV Bible verses about hatred. Genesis 37:4–5 And when his brethren saw that their father loved him more than all his brethren, they hated him, and could not speak peaceably unto him. And Joseph dreamed a dream, and he told it his brethren: and they hated him yet the more. Psalm 105:23–25 Israel also came into Egypt; And Jacob sojourned in the land of Ham. And he increased his people greatly; And made them stronger than their enemies. He turned their heart to hate his people, To deal subtilly with his servants. 2 Samuel 13:14–15 Howbeit he would not hearken unto her voice: but, being stronger than she, forced her, and lay with her. Then Amnon hated her exceedingly; so that the hatred wherewith he hated her was greater than the love wherewith he had loved her. And Amnon said unto her, Arise, be gone. Matthew 24:9–10 Then shall they deliver you up to be afflicted, and shall kill you: and ye shall be hated of all nations for my name’s sake. And then shall many be offended, and shall betray one another, and shall hate one another. Hatred is a powerful emotion and when you put it into action it will destroy all that is good. We must always be careful to hate only those things that the LORD hates and look beyond the unlovable things of this world and let love rule in our hearts. For if love rules in our heart our actions will reflect what God wants the world to see. Previous post: How Should Christians Deal With Mental Illness? Next post: Should Christians Boycott Businesses Or Products?